Karate is a Japanese Martial Arts system that focuses on kicks and punches. Who doesn’t want to do that? It’s fun! It’s true. Exercise is something we all need whether we like it or not. Why not make it fun? With warm ups that include jumping jacks, push ups, and even some games, you’ll be feeling stronger in no time. Even just daily karate will strengthen your legs, your arms, your back and your core. You’ll have a six pack brewing underneath that white karate uniform in no time. Stand tall. You are going to be feeling great! Ever encounter a bully? How do you deal with opposition? Need coping mechanisms for dealing with adversity? Stressed? Most importantly, CAN YOU TAKE A HIT? Karate teaches us resilience. It isn’t just about taking a physical hit. It’s about coping with a disappointment in real life and then GETTING BACK UP! Getting hit (physically or metaphorically) means we will learn to better protect ourselves. BEING PREPARED!! It’s about setting boundaries, coping, and learning to defend ourselves. A good Martial Arts school isn’t just about respecting the instructors. A Martial Arts school that is built on the back of stroking some black belt’s ego doesn’t do anyone any good. Remember… a good Martial Arts school is about respecting everyone – including yourself. Studying Martial Arts requires respect and humility. When kids are encouraged to take part and understand the etiquette and routines associated with karate, they are bound to be more respectful in everyday life. Kids are more likely to actively listen, engage and participate when they know exactly what is expected of them. How many sports can you think of that aren’t segregated because of gender? Martial Arts allows boys and girls to learn together – without limitations and without judgement. Girls and boys alike can focus on technical proficiency, strength training, and self-defence. Who wouldn’t want that for their children? Ever been cut from a sports team? Spend time on a bench? Martial Arts is for everyone. While learning and working together as a team, with camaraderie still in tact, Martial Arts’ primary focus is on individual achievement. Everyone gets to participate and feel good. There is no bench time. Karate isn’t just for kids. Everyone can do it! With classes for kids and adults alike, everyone can join in the fun! Enjoy year round availability, flexible scheduling, frequent classes, and discounted rates for additional household members. Join now! 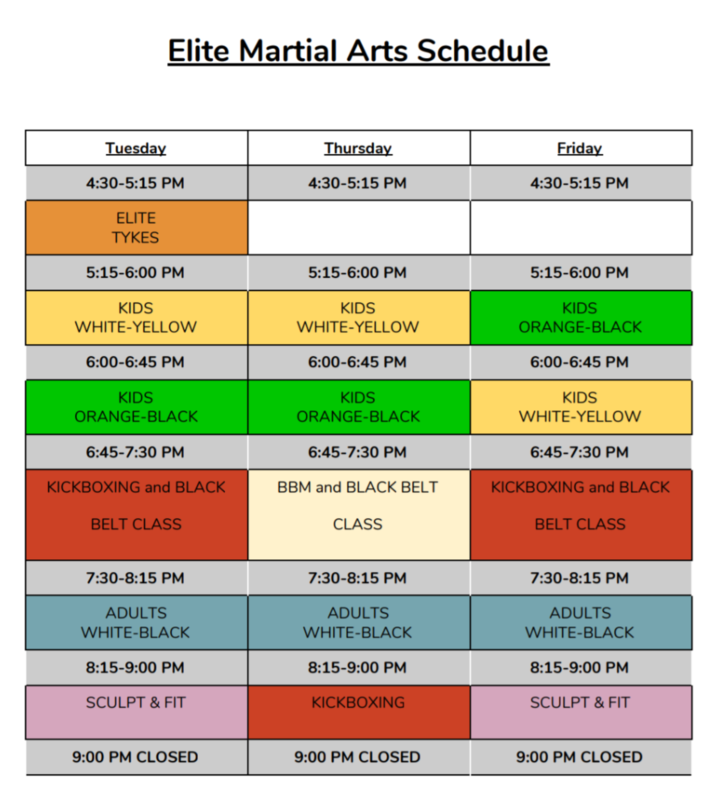 Give us a call today at (613) 834-0802 or e-mail us at elitemartialartsguy@gmail.com to book your introductory class.